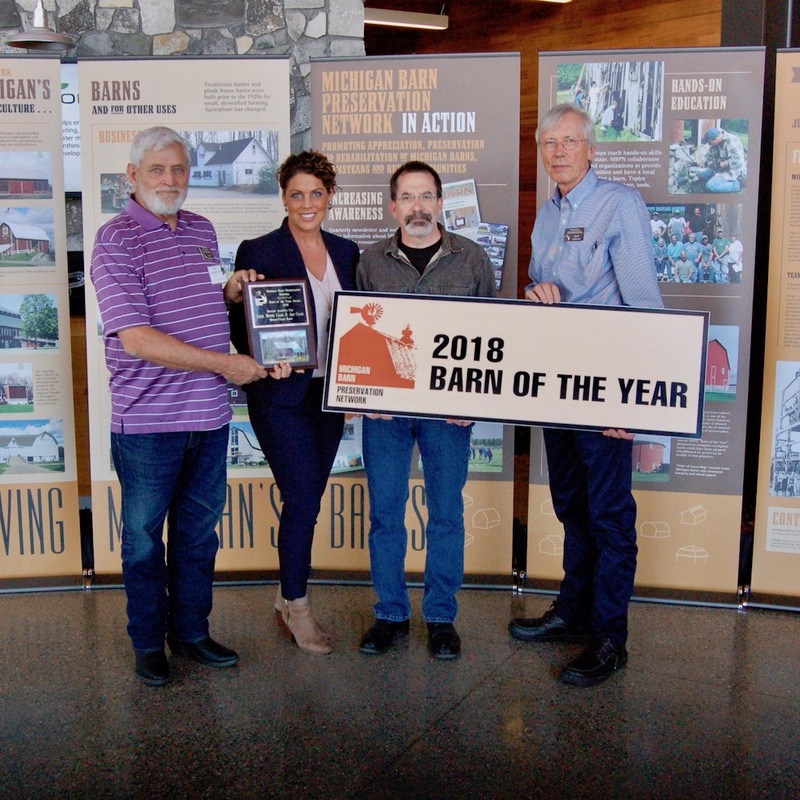 Keith Lundberg and his sister Kay Lundberg Ardis along with Kay’s daughter Angela, accept the Barn of the Year Award from MBPN’s President Clare Koenigsknecht at AgroLiquid Conference Center in St. Johns at the Michigan Barn Preservation Network’s Annual Conference on May 5. This beautiful 101 year old barn sits on an 80-acre preserved Centennial Farm settled in 1865 by the 4th generation owner’s great-grandfather. 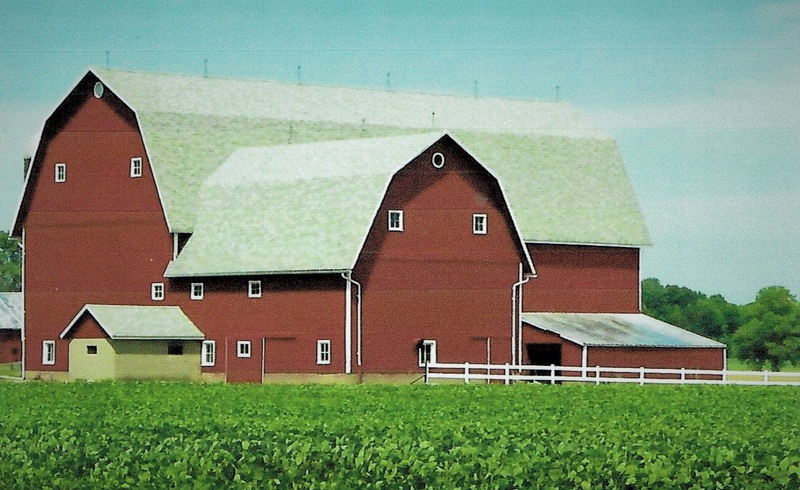 The gambrel roofed, 96 feet long barn no longer holds its long-standing herd of Holstein dairy cows, but still is used for hay & straw storage and housing for farm machinery. Having twice been featured on MBPN’s annual barn tour, it also is toured regularly by guests at the restored farmhouse which is now known as The Legend Bed & Breakfast. Unlike many barns that have deteriorated and needed a complete restoration, this barn has been continually maintained. 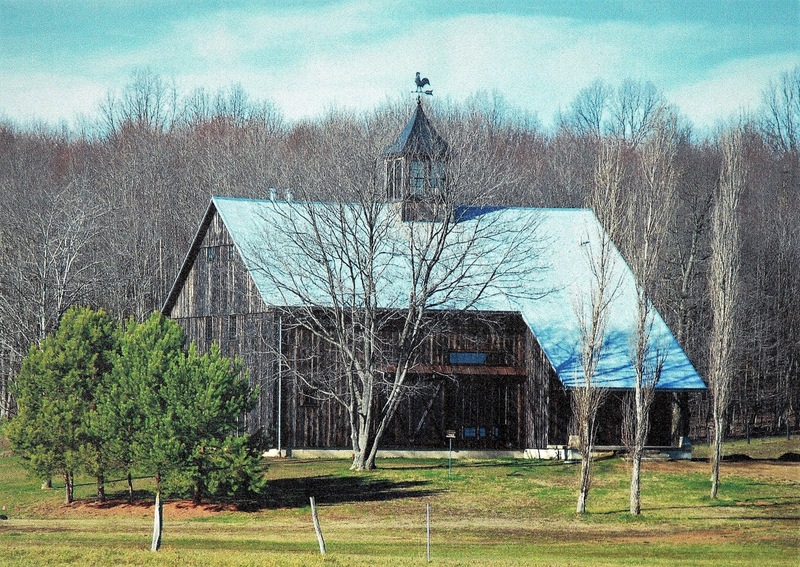 There are few barns that are maintained this well and stand proudly after more than a century. 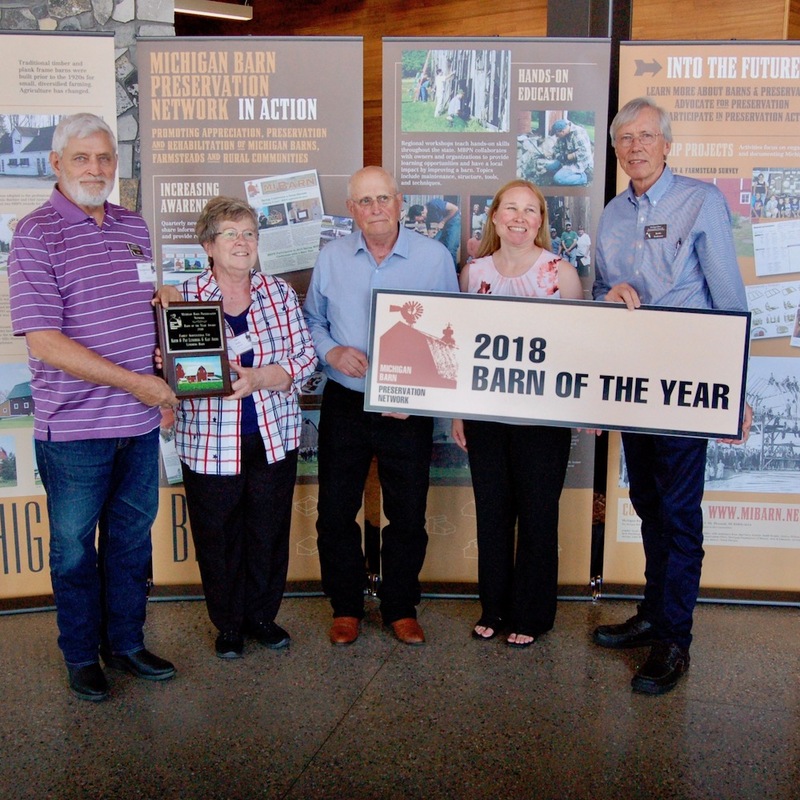 David and Kathleen Mayo accompanied by their two children and daughter-in-law accept the Barn of the Year Award from MBPN’s President Clare Koenigsknecht at the AgroLiquid Conference Center in St. Johns at the Michigan Barn Preservation Network’s Annual Conference on May 5. Also pictured (right) are the barn’s restorer, Dean Sutton & his family. This 72-foot gable-roofed, very simple, early barn was built in the mid to late 1800s. Its timber frame sports mostly water-sawn timber complete with tenon wood peg joints. Its rafters and floor joists were constructed with log poles. It underwent a complete restoration in 2015-17 with sensitivity to returning it to its original historic fabric, which meant undoing some of the more modern patch jobs it had endured. The restoration work was performed by JDS Historical Restoration under the direction of Dean Sutton. Having been topped off with a fresh red paint and white trim job, the upper level has hosted social events including weddings. Mr. and Mrs. Tom Bruins accept the Barn of the Year Award from MBPN’s President Clare Koenigsknecht at the AgroLiquid Conference Center in St. Johns at the Michigan Barn Preservation Network’s Annual Conference on May 5. 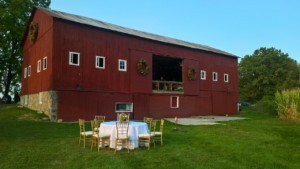 Originally built in the late 1800s or early 1900s, this barn is now in its 2nd life as a barn. 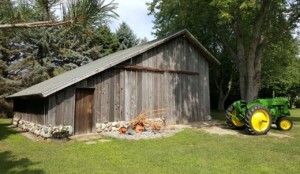 First built as a 60 foot gambrel-roofed rectangular dairy barn, it is now a 24 foot “saltbox” style barn housing the owner’s collection of vintage John Deere tractors, as well as housing a wood shop, and storage for the family’s camper and 4-wheeler. Its 2nd life began with a move and rebuild in 1993-95. Its story is a familiar one—the barn fell into neglect, the roof rotted and collapsed, laying it open to inevitable destruction. The new barn’s hero disassembled it over a 2-year period, and with the help of the Men’s Ministry of the Allendale Reformed Church, reassembled it in its new location. The spot where it originally stood is now covered by dormitories of an ever-expanding Grand Valley State University. 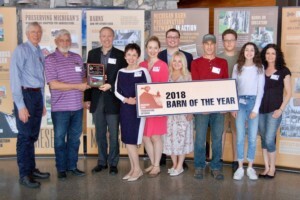 Liezl Moser Craig accepts the Barn of the Year Award from MBPN’s President Clare Koenigsknecht at the AgroLiquid Conference Center in St. Johns at the Michigan Bar Preservation Network’s Annual Conference on May 5. Also pictured is Charles Bultman, Ann Arbor architect who engineered the barn’s transformation. 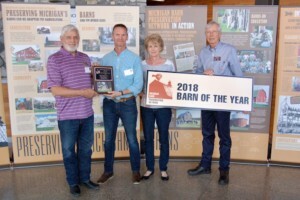 This award-winning structure is a new house built from an old barn during 2012-2014. The Original barn was an intact pre-Civil War barn with unique features sitting on land West of Ann Arbor slated for development. 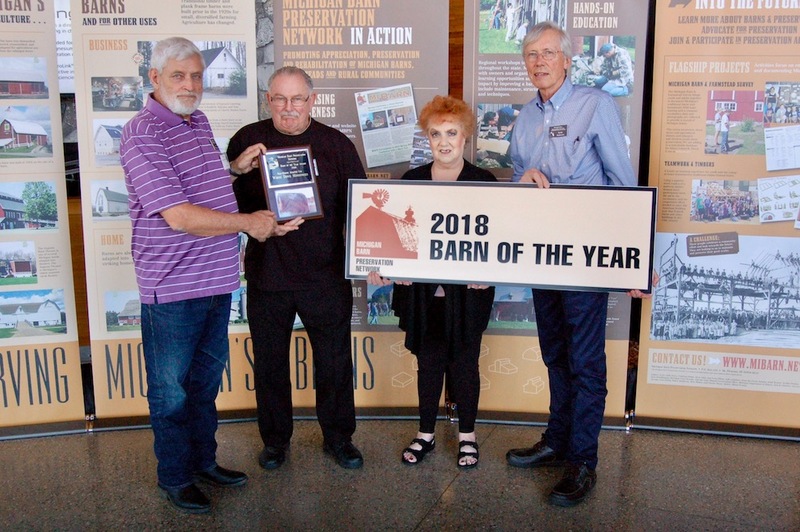 A similar, familiar story of old barns from a past era, the barn had a hole in the roof, it is in the way of development, the land is sold, and plans were made to knock it down. In stepped a couple looking for an unwanted barn to convert to a house. In the end, the barn was disassembled, the barn was salvaged and moved to a new site and began its new life as a valued and wanted house, complete with an added cupola. 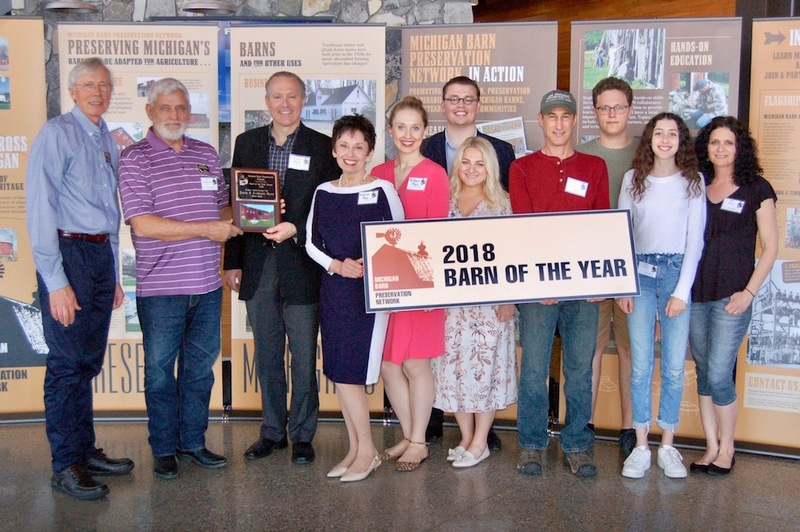 While no longer sitting on its stone foundation near Ann Arbor, the barn retains much of its original materials, a compromise victory for people who prize barns and recognize its value and rejoice that it was given new life. Accepting the Barn of the Year Award from MBPN’s President Clare Koenigsknecht are the Co-Directors of the White Dove Ministries, Mel and Jimme Nieswender. The awards were presented at MBPN’s Spring Conference May 5 held at the AgroLiquid Conference Center in St. Johns. A barn built in the 1920s, the 80 acres of farmland on which it stood was purchased by a non-profit religious organization. The farm was to be used as a retreat for pastors and a shelter for clients undergoing treatment. With holes in the roof, rotting siding, no electricity and multiple other issues, the question arose, “What’s to be done with that old barn?” Thankfully, and with gratitude to its caring new owners, the answer was a 2-year restoration including new siding, new roof and new wiring. Inside, the upper floor has been converted into a chapel. Most striking to passersby and visitors and guests is the new roof which beautifully depicts a White Dove. The barn exists today because a decision was made to preserve it rather than demolish it.